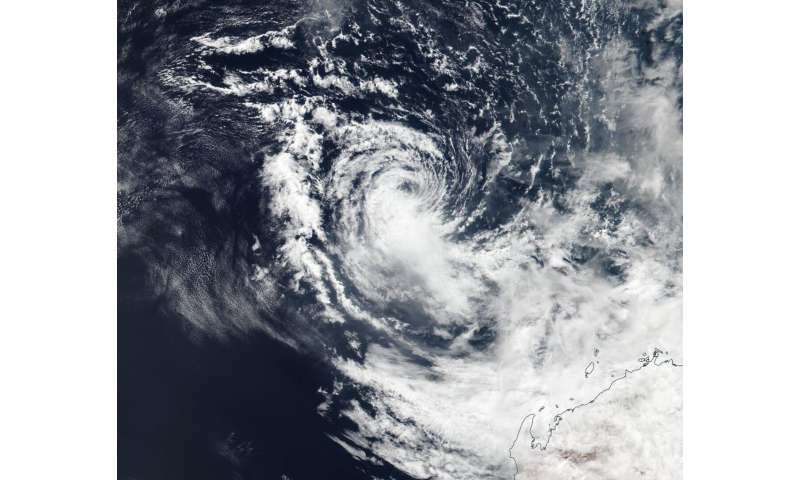 NASA-NOAA's Suomi NPP satellite passed over the Southern Indian Ocean and captured a visible image of Tropical Cyclone Wallace on April 10 as it continued to dissipate off the coast of Western Australia. Credit: NASA Worldview, Earth Observing System Data and Information System (EOSDIS). Tropical Cyclone Wallace was dissipating in the Southern Indian Ocean when NASA-NOAA's Suomi NPP satellite passed overhead. Wallace was located off the northwestern coast of Western Australia. The Australian Bureau of Meteorology or ABM noted that a Strong Wind Warning was in effect for the Esperance Coast and Eucla Coast on April 10 as Wallace continued weakening far off the coast of Western Australia. NASA-NOAA's Suomi NPP satellite passed over Wallace on April 10 and the Visible Infrared Imaging Radiometer Suite (VIIRS) instrument provided a visible image of the storm. The VIIRS image showed wind shear has pushed the bulk of the system's clouds southeast of the center, and was tearing the storm apart. At 11 p.m. EDT on April 9 (0300 UTC on April 10), the Joint Typhoon Warning Center issued the final bulletin on Tropical Cyclone Wallace. At that time, maximum sustained winds were near 35 knots (40 mph/65 kph). Wallace was centered near 16.9 degrees south latitude and 111.9 east longitude. That's about 344 nautical miles north-northwest of Learmonth. Wallace was moving to the west. Wind shear is forecast to increase over April 10 and Wallace is expected to dissipate by April 11.